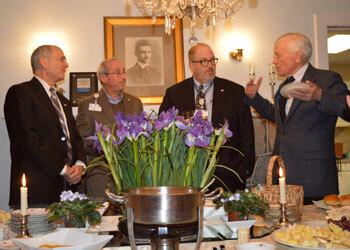 Beebe Medical Foundation hosted a Celebration of Beebe’s Interventional Cardiology Team on Monday, February 20. Beebe is the only hospital on Delmarva recognized by Healthgrades as America’s 100 Best Hospitals for Coronary Intervention Procedures in 2017. The recognition places Beebe among the Top 5 percent of hospitals in the nation for coronary intervention procedures. These procedures include the life-saving balloon angioplasties with stent insertions that open coronary arteries blocked during a heart attack. The celebration was a chance to recognize Beebe’s interventional cardiologists Mouhanad Freih, MD; Robert Myers, MD; and Ehtasham Qureshi, MD. During the celebration, each cardiologist group was presented with a plaque recognizing them for the Healthgrades distinction. Each of the doctors, their office staff, and the hospital support team, received congratulations from Mr. Jeffrey M. Fried, President & CEO, Beebe Healthcare; The Honorable William Swain Lee, Chairman of the Beebe Board of Directors; Judy Aliquo, President & CEO, Beebe Medical Foundation; and Tom Protack, Vice President of Development, Beebe Medical Foundation. Sarah Gilmour, a patient of Dr. Ehtasham Qureshi’s, gave a testimonial of her excellent care received at Beebe. “The cardiac team was there with me each step of the way, providing information and support about the next step. I ended up needing a stent and I felt so safe with Dr. Qureshi and the team. I knew they would take care of me,” Gilmour said. 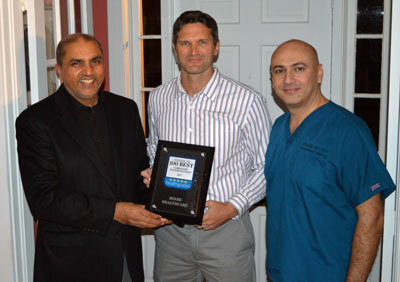 Top: Accepting the awards on behalf of their teams (left to right) are Dr. Ehtasham Qureshi, Dr. Robert Myers, and Dr. Mouhanad Freih, all interventional cardiologists at Beebe Healthcare. Above: Bill Lee group: The reception brought together cardiac teams and leaders of Beebe Healthcare and Beebe Medical Foundation, including (left to right) Mr. Jeffrey Fried, President & CEO, Beebe Healthcare; Mr. David A. Herbert, Vice Chair, Beebe Board of Directors; Mr. Richard A. Schaffner, Jr., RN, Executive Vice President/Chief Operating Officer, Beebe Healthcare; and The Honorable William Swain Lee, Chairman, Beebe Board of Directors.